Wine production in Greece dates back to the early Greek and Cretan civilizations, and it was an integral part of the Mediterranean wine trade industry. Yet in the history of modern wine, Greece has been more of a footnote in comparison to juggernauts of the industry such as France, Italy, Spain, or Germany. Thankfully, that is rapidly changing. This is in part due to the recent movement within the wine world to seek out “new” and “undiscovered” grape varieties and regions, as well as the significant increase in the quality of the wines being produced. There has been a realization by the wine market and consumers that an entire world of wine that exists outside of the 20 or so most common varietals from the classics of the New World and Old World. It is not so much that Greek wine varieties are new or unknown at all, but their presence on the larger global wine market has, until recently, been quite limited. Greece could arguably be included in a group wine producing countries known as the “New” Old World. This includes other eastern European states that have long histories of wine production, but only relatively recent global recognition. 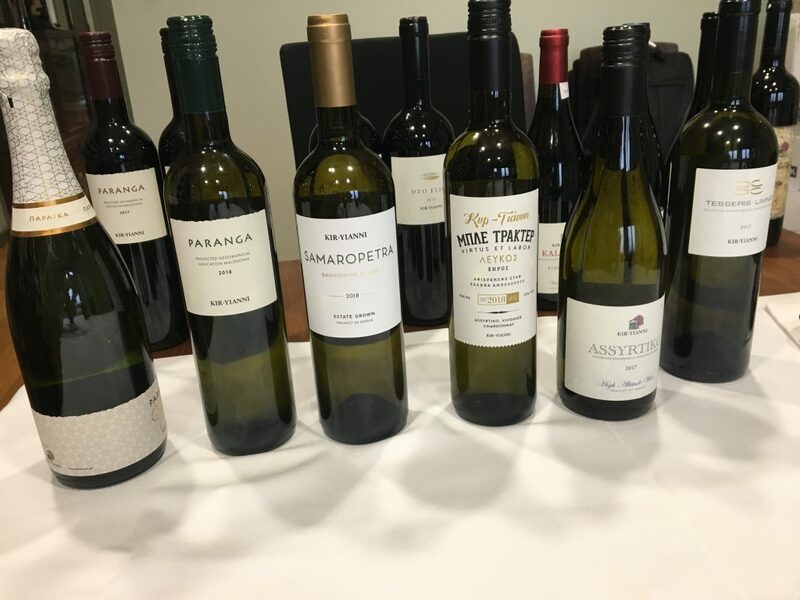 The rise of Assyrtiko from Santorini as one of the flagship Greek wines has also helped propel global awareness of Greek wines as having serious quality and potential. However, Greece can do more than just impressive whites. The indigenous red grape varieties of Agiorgitiko and Xinomavro have proven to be capable of producing serious and age-worthy wines which stand up in competition to other “great” wines of the world in quality and complexity. I recently dropped into Thessaloniki, Greece’s second largest city after Athens, for about a week and spent my time visiting 4 wineries in the surrounding regions of Naoussa and Epanoumi. It was an eye-opening experience in terms of the types of terrain and styles of wine that are being produced there and the extreme levels of quality they have achieved. It was also a fascinating and humbling look into the history and dedication that the people who run these wineries have towards their respective regions and both indigenous and international varieties. 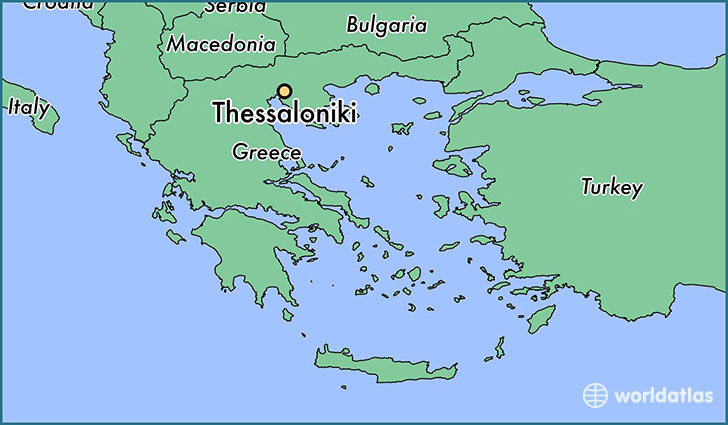 The most well-known and respected of the wine regions in the Northern Greek province of Macedonia is the Naoussa region, which has its own Protected Designation of Origin (PDO), the highest level of quality control in Greece, similar to the French Appellation D’Origine Controlle (AOC). The wines that can carry the PDO label here are made from 100% Xinomavro. There are a number of other surrounding wine regions including Goumenissa, Amnydeon, and Rapsani which also grow Xinomavro but have a wider diversity of plantings and their PDO designations allow for Xinomavro to be blended with other native varieties such as Negoska, Limnio, and Krassato. I was lucky enough to visit 3 different wineries in the Naoussa PDO, which provided a snapshot of the range and style of the wines being produced here from 3 very different producers in terms of size, history and winemaking technique. The first place I visited was Ktima Kir-Yianni, located in the heart of the Naoussa area, in the sub-region of Giannakochori. Kir-Yianni was founded by Yiannis Boutari, who comes from the Boutari family who are major players in the wine industry in Greece, having gotten their start in the wine business in the 1850’s. 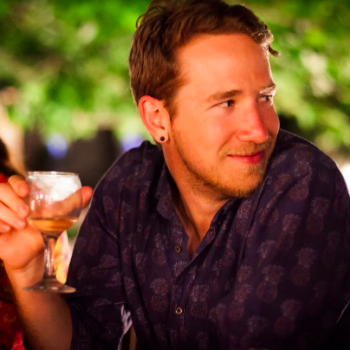 Today, the winery is run by Stellios Boutaris, who is Yiannis’s son and has really made an emphasis on putting his own stamp on the style and quality of the wines being produced. 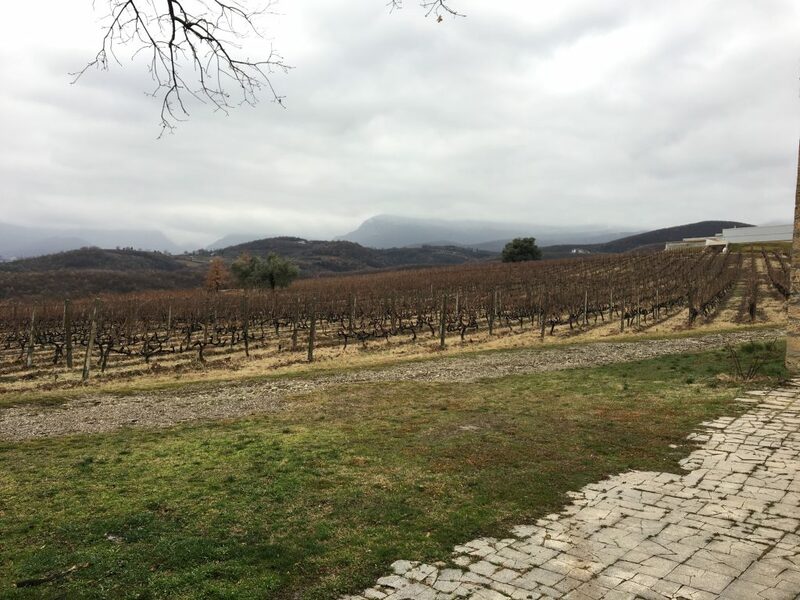 One of the first things that struck me as I stepped on to the premises of the Ktima (Greek for Domaine), was the sweeping backdrop of steep, rocky mountains looming over the vineyards. The slightly overcast day and brisk breeze blowing made the prospect of tasting some delicious red wines very appealing. The Kir-Yianni estate vineyards in Naoussa consists of 50-hectares of exclusively red grapes and are planted predominantly with Xinomavro, Merlot, and Syrah. They have a smattering of experimental plantings on the site as well, but nothing that is currently commercially released. I was warmly greeted and welcomed by Antonis Kiosseoglou, the chief Oenologist and winemaker for Kir-Yianni, and Yiota Karanatsiou, who is responsible for admin and visitor relations. As I was introduced to the Estate it became clear that Kir-Yianni is responsible for much more than the site I visited. They have another winery in Amyndeon, and vineyards in Goumenissa as well. In those areas they produce their estate white wines, and a separate label of entry-level wines called Paranga. After our introduction, a tour of the winery facilities and a venture into the vineyards helped set the scene for me. The winery is beautiful, well designed and has all of the trappings of a modern winery. 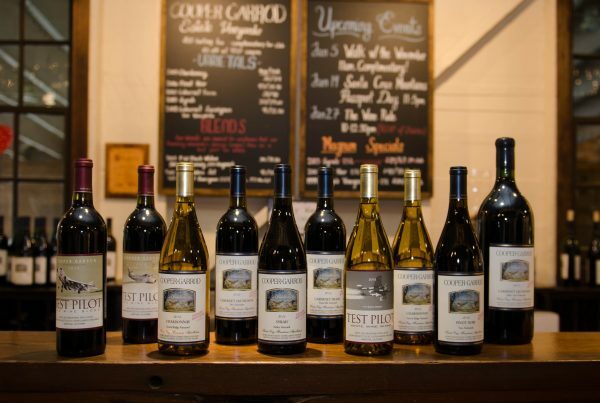 Temperature-controlled stainless-steel tanks, a barrel-aging room, their own bottling line, and a lovely tasting room with pictures and objects from the winery’s history on display. The vineyards themselves are also quite beautiful. The 50-hectares are comprised of 33 different parcels, all on a slope of varying degrees allowing for good drainage and even sun exposure. Each parcel is planted with the grape variety that will give the best expression from that particular soil type. The oldest vines on in the vineyard date back to the 1970s and they are Xinomavro and Syrah vines. 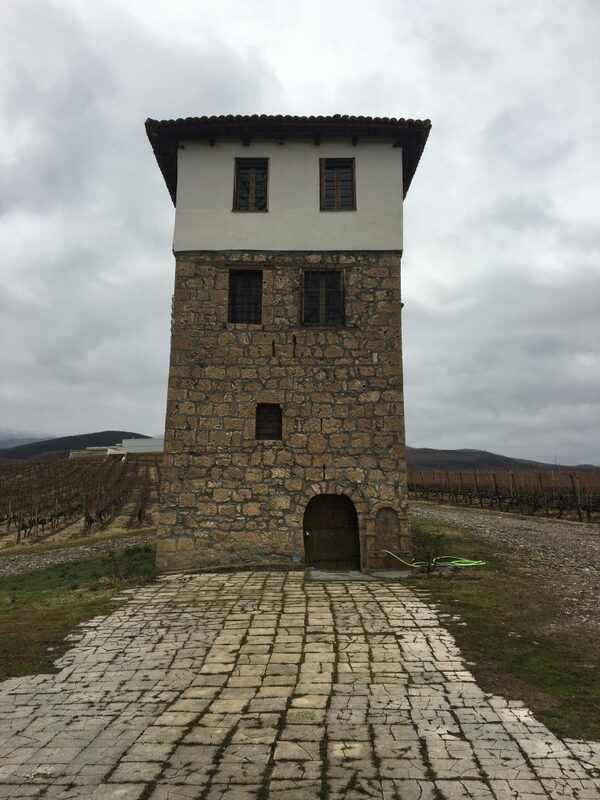 There is a unique building located in the vineyards which is featured prominently on the Kir-Yianni label, and that is a 200-year-old stone tower known as a Koula, which means observatory. This is a remnant of the time when the Turkish Ottoman empire ruled the region. It is a striking and beautiful building. According to my guide, Yiota, it was even occupied by Yiannis Boutari at one point during the early years of the winery. It is currently unused, but there are plans to renovate it and use it as a part of the winery visitors’ experience. It became clear from the tour and then during the tasting, that at Kir-Yianni, Xinomavro is king. 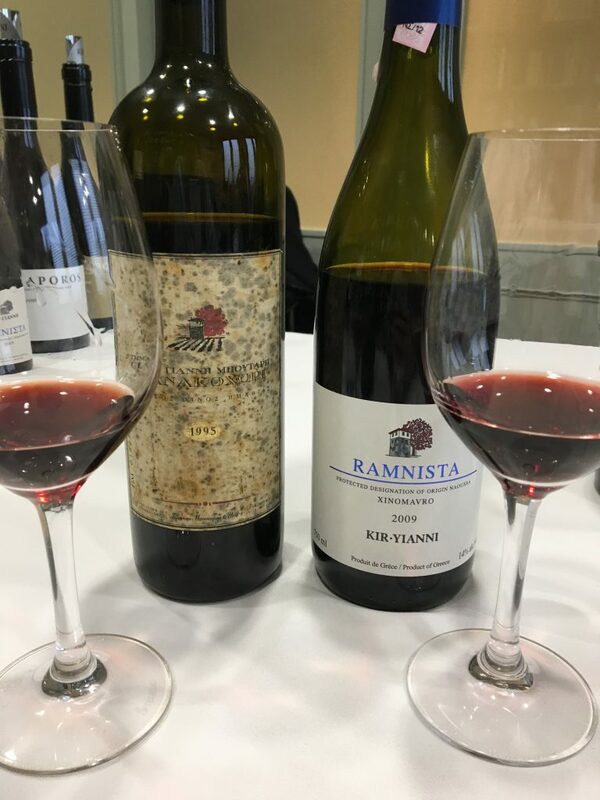 The flagship wine of the estate is the Ramnista bottling, which is sold both in Greece and internationally, and to which Antonis and Yiota refer to as their “ambassador” wine. Ramnista is 100% Xinomavro and created from a blend of 7 of the best blocks on the estate. Xinomavro as a variety is quite tricky to grow because uncontrolled, the yields will be too high to produce wines of concentration. In addition, the grapes naturally have very high acidity and very high tannins which means that picking at phenolic ripeness to ensure balanced acidity, tannin and flavor is challenging. All of these variables make the timing of the harvest, yield control, and vinification methods, extremely important when making Xinomavro wines. But the payoff when its done right is worth the effort. Currently, Kir-Yianni harvests its Xinomavro grapes, destems, and does a 4-day cold soak for aroma and color extraction. Alcoholic fermentation occurs in stainless steel, and then maturation occurs in French oak barrels. 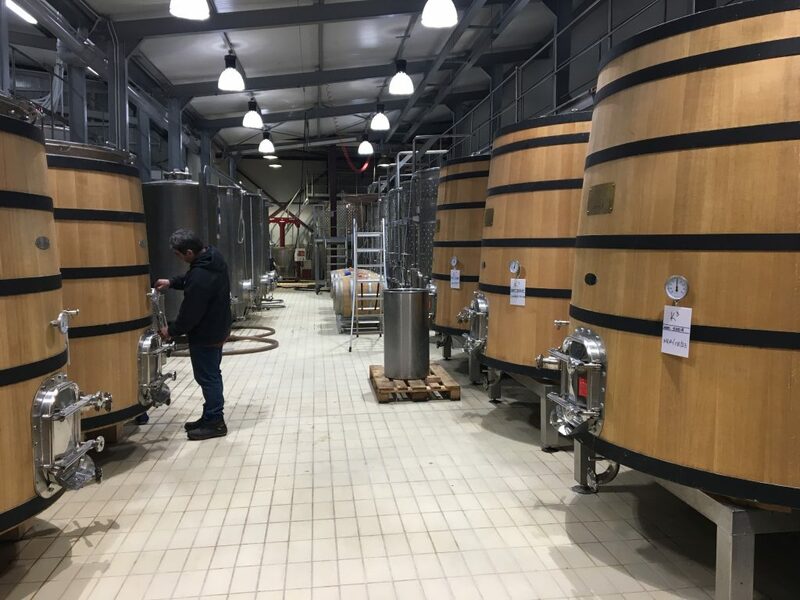 However, they have begun to experiment with fermentation in large-format oak barrels to allow a bit of oxidation into the fermentation stage in the hopes of finding a more texturally interesting wine as well as taming some of the wild tannins of the Xinomavro wines in order to make them more approachable at a young age. With that kind of introduction, I was more and more excited to taste these wines. However, it is important to also mention the quality of the white wines and other reds produced by Kir-Yianni. All of their estate wines were very good. Even the Paranga line which is their “value” label was well made and fit the category they were aiming for. One of the whites that stood out was an interesting blend of Chardonnay and Gewürztraminer called Tesseris Limnes which means “four lakes”. It had a lovely aromatic nose, rich texture, balanced acidity and ripe fruit on the palate. It was nice to see an unusual combination of varieties that married so well. As we made our way through the tasting, we finally got to the Xinomavro wines and it became clear that these were the pride and joy of the winery. They make several cuvees of Xinomavro; Kali Riza, a more approachable wine at a young age from old vines in Amnydeon, the Ramnista bottling from their estate vineyards in Naoussa, and finally Diaporos, a powerful and modern-style Xinomavro/Syrah blend from a single block of old vines on the Naoussa estate. The stand out for me was their Ramnista bottling. I was able to try their 2015, 2009 and then a bottle from 1995 (to which a bit of Merlot had been added back then). It was increasingly apparent that Ramnista is a benchmark bottling of Xinomavro, expressive and extremely well structured. Built to age because of the grape’s natural tannic and acidic components, it has gorgeous floral, fruit, and earthy aromas that only get prettier with age. The youngest of the 3 was still very tannic and powerful. Notes of smoke, roses, and black cherry were apparent, and the aromatic intensity was high. The 2009 bottle was perhaps the prettiest, with a beautiful integration of flavors and aromas, the tannins had softened enough, but the core structure remained, and the finish went on for days. Finally, the 1995 was a real treat, just being able to drink a wine that is almost 25 years old, and for it to have as much flavor, tannin and energy that it did is a testament to the quality of the Xinomavro variety, as well as the history that Kir-Yianni has in this region. As we wrapped up the tasting and visit for the day, I was treated to a lovely late lunch with Antonis and a glass of the 2009 Ramnista to enjoy. There were a few things that struck me as I was wrapping up my visit to Ktima Kir-Yianni, first: the incredible hospitality and kindness that I was shown as a visitor to the estate. Secondly, the amazing energy and enthusiasm the team had for their work and for the wines they were making, it was clear they believed wholeheartedly in the quality of their products and the potential they had in the wine-market. Finally, it was the quality of the wines themselves, the bottles spoke loud and clear and justified my decision to explore this Greek wine region, and hopefully to help spread the word to others about how delicious they are! Stay tuned for the next episode of my Greek wine adventure!